by Robbins, Stephen P.; Coulter, Mary A.; De Cenzo, David A. NOTE: Before purchasing, check with your instructor to ensure you select the correct ISBN. Several versions of Pearson's MyLab™ & Mastering™ platforms exist for each title, and registrations are not transferable. To register for and use Pearson's MyLab & Mastering platforms, you may also need a Course ID, which your instructor will provide. For Principles of Management courses. This package includes MyLab Management . The 10th Edition has been updated with the latest coverage on hot topics such as sustainability, holacracy, the sharing economy, gamification, data analytics/big data, BYOD (bring your own device), and wearable technology. Engaging and fun videos and exercises motivate readers and give them the practice they need to become successful managers. 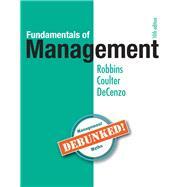 Fundamentals of Management, 10th Edition is also available via Revel™, an interactive learning environment that enables students to read, practice, and study in one continuous experience. Stephen P. Robbins received his Ph.D. from the University of Arizona. He previously worked for Shell Oil Company and Reynolds Metals Company and has taught at the University of Nebraska at Omaha, Concordia University in Montreal, the University of Baltimore, Southern Illinois University at Edwardsville, and San Diego State University. He is currently professor emeritus in management at San Diego State. Dr. Robbins’s research interests have focused on conflict, power, and politics in organizations, behavioral decision making, and the development of effective interpersonal skills. His articles on these and other topics have appeared in such journals as Business Horizons, California Management Review, Business and Economic Perspectives, International Management, Management Review, Canadian Personnel and Industrial Relations, and The Journal of Management Education. Dr. Robbins is the world’s best-selling textbook author in the areas of management and organizational behavior. His books have sold more than 7 million copies and have been translated into 20 languages. His books are currently used at more than 1,500 U.S. colleges and universities, as well as hundreds of schools throughout Canada, Latin America, Australia, New Zealand, Asia, and Europe. Dr. Robbins also participates in masters track competition. Since turning 50 in 1993, he’s won 23 national championships and 14 world titles. He was inducted into the U.S. Masters Track & Field Hall of Fame in 2005. Mary Coulter (Ph.D., University of Arkansas) held different jobs including high school teacher, legal assistant, and city government program planner before completing her graduate work. She has taught at Drury University, the University of Arkansas, Trinity University, and Missouri State University. She is currently professor emeritus of management at Missouri State University. In addition to Fundamentals of Management, Dr. Coulter has published other books with Pearson including Management (with Stephen P. Robbins), Strategic Management in Action, and Entrepreneurship in Action. David A. Decenzo (Ph.D., West Virginia University) is president of Coastal Carolina University in Conway, South Carolina. He has been at Coastal since 2002 when he took over leadership of the E. Craig Wall Sr. College of Business. As president, Dr. DeCenzo has implemented a comprehensive strategic planning process, ensured fiscal accountability through policy and practice, and promoted assessment and transparency throughout the University. Before joining the Coastal faculty in 2002, he served as director of partnership development in the College of Business and Economics at Towson University in Maryland. He is an experienced industry consultant, corporate trainer, public speaker, and board member. Dr. DeCenzo is the author of numerous textbooks that are used widely at colleges and universities throughout the United States and the world. Dr. DeCenzo and his wife, Terri, have four children: Mark, Meredith, Gabriella, and Natalie, and reside in Pawleys Island, South Carolina.